I cleared my first Google Cloud Certification Exam in June 2017, which was for their Professional Architect Track. 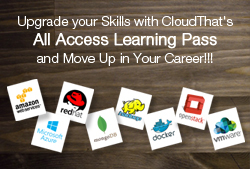 Since then many new features have been announced and another Certification, Associate Cloud Engineer has been introduced. Recently, I cleared the exam for Associate Cloud Engineer Certification and I am sharing my experiences for the same in this blog article. Microsoft Azure has been one of the market leaders offering Cloud services under IaaS and PaaS Cloud segments. There are multiple Azure services available for different business solutions. As per the current job market, there are numerous positions in demand for Microsoft Azure. How to make your App Containers Highly Available with HAProxy? Inter-Region VPN Connection Made Easy in AWS! Its time to wave good bye to lengthy and complex setups for VPN connections. In the AWS re:Invent 2017, AWS had announced a feature which allows us to make connection between VPC’s across two different regions. With this, AWS also added few new services in the list and some mind-blowing features to the current service portfolio. In the past, programming has followed a general cycle involving write, compile, check and execute. Although this system has proved to be reliable, modern applications of programming possess alternate requirements. I have always been a proponent of text editors over IDEs. This is partly since I originally started coding with text editors and text editors ensured that I did not constantly look for auto-correct to help me. What is OCR? and How can a Beginner Implement it using Azure Cognitive Services? In this globalized world, Supply Chain has become exponentially complex. Connecting data, product, people and process across the world is becoming difficult and time consuming. IoT in Supply Chain Management is already making waves in this space. What is the quickest way to integrate NLP in an application? Cognition simply refers to the act of thinking. It is a product of evolution that only a few organisms are currently capable of. It can also be defined as the process of assimilating knowledge and developing a world view based on understanding via one’s senses and experiences. How to Process and Present IoT Data on Microsoft Azure? In my previous article on “ESP8266 Connectivity with Azure IoT Hub” we have seen, how to connect IoT device with Azure IoT Hub. We also discussed about how to configure and connect ESP8266 with Azure IoT Hub for hyper-scale messaging in a secured way.We have data from different IoT devices on Cloud, but it is futile unless we can process that data and present it in some way. CloudThat has always been a major proponent of emerging technologies such as the Cloud, Big Data and AI. Although technologies and concepts such as Big Data and Machine Learning are considered new, IoT is a concept that is newer still. Numerous Cloud service providers such as AWS and Azure have stood up and taken notice of this emerging field.